I haven’t seen any similar and more affordable desk accessories, but here are two similar bookends. Dec. 2015 Update: These exact products have sold out, but here are a few similar agate desk accessories, pictured below. You can also check out all Rab Labs items still in stock at Bergdorf’s, here. What is the right amount of time between eyebrow waxing? I know that I don’t go nearly often enough, but I’m not sure what the right pacing should be. Help me, well-groomed ones. I really think it depends on your growth and ability to handle strays. I go once or twice a year just to get some shape, and then I tweeze the underneath strays in the interim. My eyebrows were never high-maintenance but I really like the shape that I get with the threaders. Usually I go back when I notice some growth along the outside top, because I don’t feel equipped enough to tackle the top of my brows. I probably go earlier if I have an event (wedding, vacation) where there are likely to be lots of pictures. But then the friend who got me into threading goes every couple months. So it’s pretty person-specific. I get a pedicure and waxing once a month. When do you notice your eyebrows looking unruly? No judgment intended by that but I notice if I go more than 6-8 weeks, they look less than well-kept. It does depend on your growth – I prefer just to get mine threaded rather than maintain in between appointments but I think as long as you’re going once every few months or so, you can maintain the shaping. I can only make it three weeks, but I have unusually hairy brows. Most people I know wait 4-5 weeks. I go every 2 weeks. Sometimes I can stretch it to 3, but if I miss an appointment, I can always tell and it drives me crazy. ETA: this is the one thing I’m REALLY high maintenance about. I could tweeze, but I always like it better after being waxed. I get mine done once a month. But where I live, they’re just 10-12 bucks per visit and we don’t tip! So cost is lower than it might be in the US. I go for tweezing every 4 weeks. I hate plucking my eyebrows myself so I outsource this. I think it’s been about four years for me. I love agates! 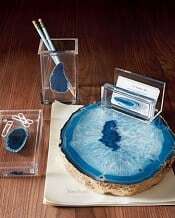 In fact I have a blue agate on my desk right now. Love the platter but don’t like the agates in lucite much. Yay! I agree with Coach Laura b/c I also love Agates! What is it? Anyway, I hope the hive can help me. When I was in the Hamton’s, 3 guy’s said I was cute, but NONE thought I was cute enough to MARRY me. What is it that makes a woman cute enough to Marry? Or is being cute a liability? I hope not b/c I do NOT want to have to start lookeing dumpy just to get a man to marry me. Dad say’s I should NOT have to and I agree. Does the HIVE know (and can share) their secret’s as to how I can get a decent guy to MARRY me? So far, onley schlubs have wanted to marry me, and most of them are NOT even holdeing real job’s. One guy worked for a while at Kohl’s, but left when his supervisor heard him makeing strange noises out on the sales floor. Another guy from college lives at home and his mom gives him $100 every week to spend on himself, so he does NOT want to have to work for a liveing. I would NEVER marry a schlub like that. Finaly, there is a guy who has a gradueate degree from a decent school, but say’s he is an enterprenur, and his parent’s support him also. Why would I marry him? I would wind up supporting him, not the other way round. All I need is ONE decent guy with a good job who want’s kids and a house in Chapaqua. What is so hard about that? Can anyone help expleain? Thank you. I have the celestial pattern coaster and people have asked me if it’s an agate. Now I’m coveting the gilt-edged coasters! you guise, I send in one job app yesterday. I’m trying to be proud of myself, but I was supposed to do more than that this weekend. I did get work done on a couple of others that I should be able to finish and send in in a couple of days. But I’m not feeling like I’m as on top of it as I should be. Anyway, just trying to hold myself accountable by saying this out loud. Getting the momentum going is the most important part! Good job! Keep it up! Thanks you two!! I lost momentum for like…. several months there. :o( I am temping right now, but it’s not sustainable. Okay, next step: One More. I need ideas for casual summer outfits that I can wear to work. My office is extremely casual, trendy, and young. Pretty much anything goes. But I still don’t feel professional in a lot of the outfits I see. Combinations that work for me are sleeveless, flowy button-downs with jeans or cropped pants, the Madewell abroad dress or anything like it with flats or wedges, or a denim shirt with a black flowy skirt and wedges. Any other ideas? I like to have at least one part of the outfit be structured or I start feeling like I’m in pajamas. Pencil skirt (there’s your structure) with drapey linen sweater? Check out the blog here and now – her outfits might work for you. I can’t blame you! These are so nice. Totally loving the color. Now I want some too, haha. Recommendations for amazing drinks in DC? A friend just weaned her son and wants something spectacular to celebrate. Dram and Grain (under Jack Rose). It’s a Speakeasy-style place; look on the Yelp page for details as to how to make a reservation. For wine, I’m a huge fan of Proof. +1 to the Gibson, and I’d add Denson, which is underground at 600F. If your friend likes brown liquors (scotches and bourbons, mostly), I’d suggest McClellan’s Retreat in Dupont. I got a reservation at an insanely expensive and famously hard to reserve restaurant, but it’s for table of 4. I have a number of couples in mind that we could invite to join us, but most of my friends aren’t as into food as I am and I want to make it clear that I won’t be offended if they don’t want to spend $$$$ to have this experience because I understand it might not be worth that much to them. But I don’t want to insult them by implying I think they can’t afford it. Any suggested wording? I also want to make it clear I’d love it if they joined us but we’re not treating them. “Hey, Couple X! We managed to get these amazing, hard-to-get reservations to Restaurant ABC on date X. Would you be interested in joining us? I know not everyone’s as into food as we are, so I totally get it if this isn’t your thing, but I couldn’t let the offer pass up without offering! If you mention typical prices for starters & entrees, it will hammer the point home that you’re not treating, because this wording does not make it totally clear. I like this, but I might add the price in there up front, so it’s clear they are paying. I’ve done this/had this done, and it was helpful info and not taken poorly. Obviously, YMMV. Now I’m dying to know where you’re headed! I figured! Amazing! In that case, there’s a set price, right? That could make this easier. I’m headed to Jose Andres’ Minibar on Thursday night and am so excited/pre-emptively broke. Oooh, please report back! We live on the other side of the country, but have been hoping to make a trip that way in a few years for quite some time. I just want to marry my coworker who doesn’t even know I exist. Why are acne and crushes not things left behind in middle school? I’m doing data entry today, and listening to Anne of Green Gables on audiobook. As an adult, I’m horrified by how tragic her young life was! Reading the book as a child, Anne’s orphaned, abusive childhood and constant overwork as an unpaid servant before she came to Green Gables seemed sad but didn’t strike me as quite as terrible as it does now. The same thing happened to me when I saw Les Miserables. As a child, I thought Cosette was sort of a romantic heroine, off to have her own adventures. As an adult, I was gutted by how horrifying and tragic her life was and how young she was.